If you drive an electric vehicle, such as a Tesla, you won't need to worry about having enough charge to get home after a visit to the Universal Orlando Resort. The resort announced today that it has added four electric vehicle charging stations in its CityWalk valet parking area. Two of the stations are for Teslas and two are Clipper Creek charging stations. Universal announced that this is part of its valet parking, so I would assume that you would need to pay for the valet parking ($30-35 for over two hours) in order to use the chargers. But having the valet run the charging stations should give Universal the ability to move cars from those stations once they've charged, so that one visitor can't monopolize a charging station all day while they're in the parks. 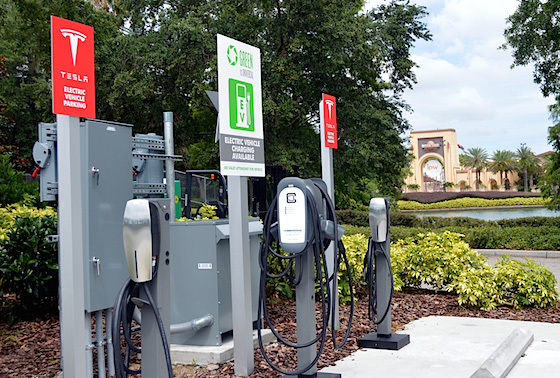 Universal Orlando's doppelgänger, the Disneyland Resort, also offers electrical vehicle charging, with 20 self-serve stations run through ChargePoint. Have you found electrical vehicle charging — either free or paid — at another theme park? Tell us in the responses. I wonder if there will someday be a car rental for TESLA? They have electric vehicle charging stations at EPCOT. Saw them there last month. It leads me to believe they are probably in all four of the Dub-Dee-Dubs. In drought-stricken California, Universal might want to give some attention to low-tech systems ... like sprinklers. ... apparently they do at Universal. Really? Now you're claiming that Disney STOLE the sprinkler head? Please! So you're trying to say that Universal builds sprinklers faster than Disney? You're trying to get away with that rubbish?! Uh... I didn't claim anything like that? So then Harry Potter sprinklers are better than Star Wars sprinklers, eh?